Our travels continue this week so here’s another look back at some of our favorite recipes. This week I’m focusing on desserts. I heard about Milk Can Supper on the America’s Test Kitchen Radio podcast in June 2014. It is a one pot meal, which I dig for efficiency sake, and it sounded intriguing. Basically you layer red potatoes, cabbage, corn on the cob, carrots, onion and bratwurst in a large pot and use a pale colored beer as the steaming liquid. I gave it a go and the results were delicious. I’ve made it, or parts of it, several times since with a couple of variations. I use our 20-quart stock pot when I make this for a crowd. If I’ve halving it then I leave out the cabbage and cook it in the dutch oven we use for stews and tomato sauce. Give this a try sometime. You won’t be sorry. Cut brats in half. Heat the oil in the stock pot over medium heat. Working in batches, brown brats, about 2 minutes on each side. Set browned brats aside. Drain the oil from the pot. Dump the potatoes into the pot. Cover these with the quartered cabbage followed by the corn, carrots and onions. Sprinkle with the salt and pepper. Tuck the bay leaves and thyme springs in among the vegetables. Arrange the brats on top of the vegetables. Pour the beer over everything, pop on the cover and bring to a boil. Reduce heat to maintain a simmer; you want to see a bit of steam come out when you take off the lid. Cook for 15 minutes. Add the bell peppers and cook for an additional 10-15 minutes. You can temp the sausages if you are worries they aren’t cooked through (160°F being the magic number). I try to stab a potato and a carrot to make sure they aren’t still hard. If you have a big enough bowl or platter you can carefully dump everything into it. For a large group I prefer to separate out the sausages, corn and cabbages (which I cut into smaller pieces after cooking) into separate bowls. The potatoes, carrots, onions and peppers end up together in another bowl. This allows the food to be passed around the table more quickly. I try to put at least some of the cooking liquid into a measuring cup to pass as well. The original recipe calls for a “light-bodied American lager, such as Budweiser”. I’m a bit of a beer snob and don’t have Bud in the house nor will I buy it just for the recipe. I’ve used Smuttynose Shoals Pale Ale in the past and most recently I used Sam Adams Porch Rocker. Both worked well. Use what you enjoy. As I suggested in the intro, this recipe can pretty easily be halved if you aren’t serving a mob. I leave out the cabbage, reduce the rest of the ingredients by half except the amount of beer. How many sausages you cook is really up to you. I’d go for at least 10 (that’s 2 packs were I shop). I honestly should just increase the number of sausages to 20 for the full recipe; they are the best part. Dinner this week was courtesy of a toss together meal I made earlier in the week using the technique from the Milk-Can Supper recipe from Cook’s Country. I was reminded of how much I enjoyed the original and decided that having steamed brats twice in one week was fine, as long as it wasn’t every week. One of my childhood memories is waking up on a summer morning to the smell of hot pickling liquid. My mom canned pickles, relish, jams and jellies throughout the summer. We would enjoy the result months later, as would family and friends who received tasty treats in the winter. 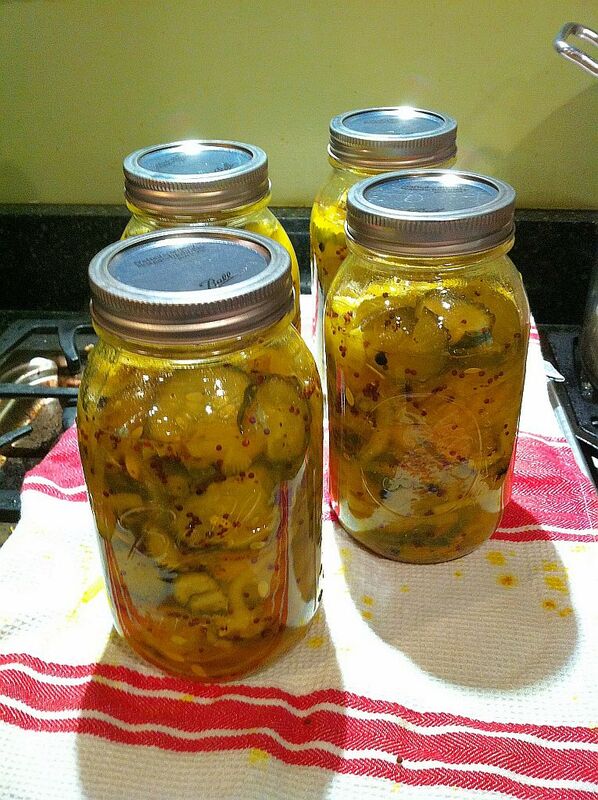 A couple of years ago I asked my mom for her bread & butter pickle recipe. She laughed and pointed me toward a worn copy of the Ball Blue Book that she had used for 40 years. My recipe is an adaptation of that one with a bit more instruction. Pickling is easy and doesn’t take a lot of special equipment. It’s a fine way to spend a summer afternoon, especially if the weather isn’t super-duper. The taste of a homemade pickle, in deepest winter, will brighten your day.